Automation of KPI calculation enables you to speed up production of all organisational KPIs giving you accurate up-to-date information and significant resource savings over existing methods. 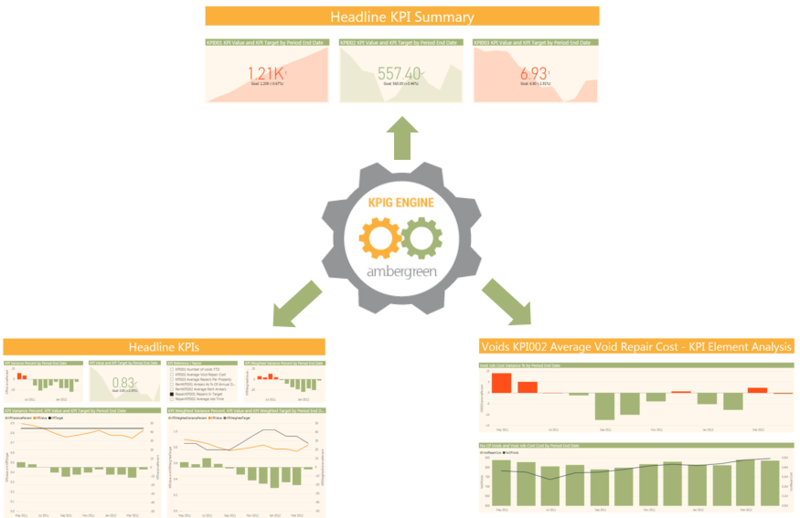 The Amber Green KPI Generator retains KPIs and their constituent elements for all previous periods and allows simple presentation of headline KPIs plus analysis – drilling, slicing and dicing – by any required dimensions. Because the underlying elements are also stored, the factors determining changes in performance are easily identifiable using tools such as PowerBI, SSRS or Business Objects. View in Full Screen mode for best effect (click on icon in bottom right of the visual). Click on the page scrollers (< >) at the bottom of the visual to access different dashboards and reports. Click on the parts of individual visuals to interact with the data. The results can be used with any reporting tool (for example Microsoft SSRS, PowerBI or Business Objects) to create powerful, interactive dashboards and reports. 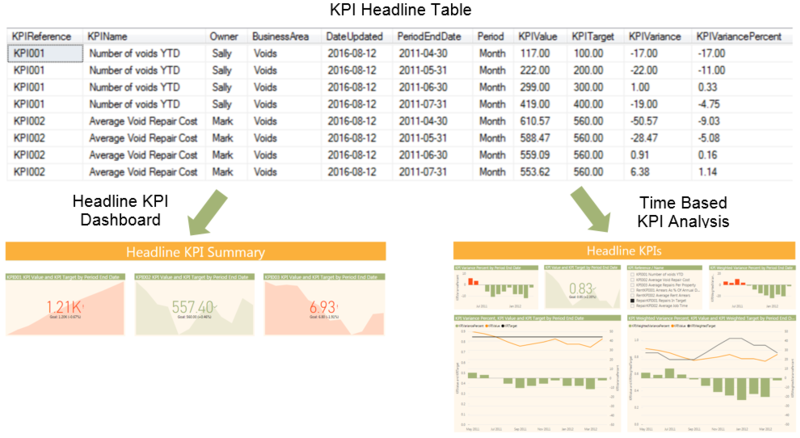 The headline table is ideal for producing headline KPI dashboards and performance analysis over time. It is very straightfoward to create these as there is no joining of tables required and just simple criteria needed such as date range. All the necessary data is already present in the table. For slightly more advanced report writers, the KPI Fact tables (one Fact table per KPI) and associated Dimension tables can be used to create any data set required. This is actually also very easy as the table joins required are self-evident and the data structure has deliberately been made very simple. 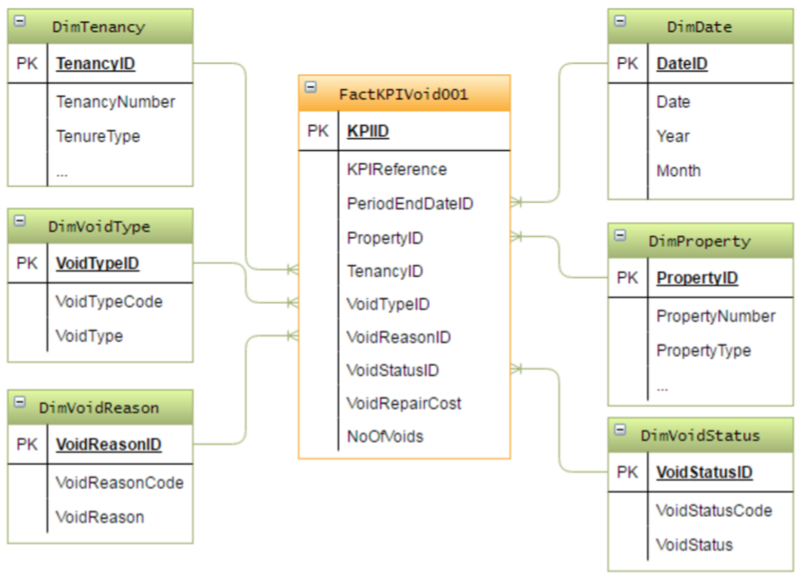 Either you can create these datasets yourselves, or Amber Green will be able to create these to your requirements. The resultant datasets can then be used with your preferred reporting tool to create interative reports. A View is created for each KPI. This provides a simple 2-dimensional table which includes all the Dimensions and Columns you have specified (via an easy to use front end). The Dimensions and Columns included can be modified as required, and the View is updated to relected your changes. This makes interactive, analytical report creation really simple. The example shown includes one report with a KPI displayed over time, and two further breakdowns in pie charts by different Dimensions. 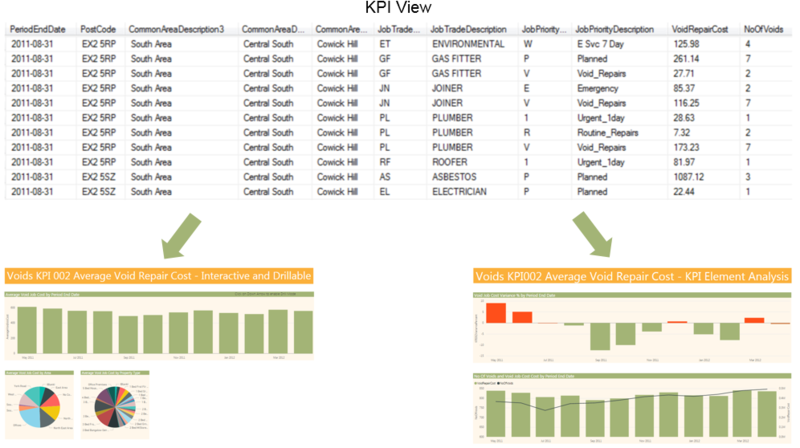 The second report shows the KPI value in the top chart, and the two constituent elements in the lower chart (Void repair cost and Number of voids in this case). This enables you to see how each element varies over time and their affect on the KPI value. All of these examples are available for you to try out and experiment with in the interactive section of this web page, above. You can't break anything, so give it a try!